This month marks the reopening of the group’s inaugural property after an elegant makeover by architecture and design practice, Rockwell Group. The reinvigorated hotel is now a patchwork of intimate, seductive spaces that provide a sense of calm from the hubbub of its Times Square locale. From the darkened entryway that features a multimedia art installation, to the main lobby on the second floor, which mixes jewel-tone finishes with blackened steel, brass and stone to create areas of openness and opacity, a thread of drama runs throughout the property. 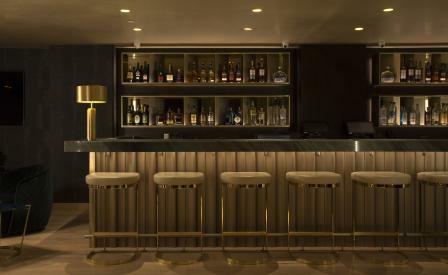 Filled with modern furniture, the lobby’s lounge, perfectly suited for work or social meetings, is partitioned by heavy curtains to reveal a sumptuous bar at night. The moody glamour continues upstairs as well; the 193 rooms feature oak panelled flooring, freestanding furniture and custom-made watercolour print rugs that effuse a residential feel. The triplex penthouse suite is particularly comfy, with a concealed kitchenette, a full dining room, two outdoor terraces and a master bedroom suite taking up one entire floor.